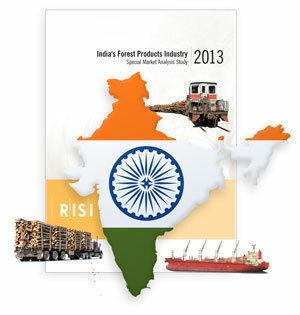 India's Forest Products Industry Outlook 2013 - Fastmarkets RISI - Objective Insight. Better Decisions. A comprehensive review and analysis of India's forest product industry and wood fiber deficit over a ten year forecast period (to 2021). Over the last ten years India’s trade deficit in forest products has soared from US$1.0 billion in 2001 to more than $5 billion in 2011. Due to the scarcity of domestic timber resources and rapidly growing demand, log imports in India have doubled since 2006 in order to meet the country’s growing appetite for wood products. India’s per capita consumption of paper and paperboard is less than 10kg (compared with 72kg/capita in China), but demand has been growing rapidly and consumption of recovered paper, wood pulp and non-wood pulp have nearly doubled over the past decade. 2013 India’s Forest Products Industry Outlook provides a unique analysis of the potential development of the world’s next substantial wood fiber import market (after China), based on domestic resource availability and the demographic and economic trends driving demand. This study evaluates the farm forestry programs being launched in India (primarily by the paper companies), and the strategies being explored by this sector to meet increasing demand growth. The study includes 10-year historical data on India’s forest products trade, and forecasts imports of logs, lumber and pulp and paper products through 2021. Which are the major suppliers of paper products to India? It is expected that India’s growth trajectory of imports will not follow China’s explosive patterns, yet will still be one of the most important trends in global timber demand as India’s increasing need for imported wood fiber is expected to be sustained for several decades. This study explores the similarities and differences between the economic development and forest industry evolution of India and China over the last five years. 2013 India’s Forest Products Industry Outlook is an essential tool for understanding the path of development of India’s forest industry, and the outlook for investment and imports of wood products, pulp, and paper. III. India: The “Next China”?